At the end of October I finally became a homeowner. After years and years of renting, wasting my money to line some strangers pocket, I’m finally lining my own! To be honest, up until around 8 months ago I’d always written off the possibility of owning a home. I never dreamed that I would be able to do it alone. Yet here I am in my little two-bed semi-detached house, writing this blog post. I’ll do a further blog post with the buying process and just how I afforded it at a later date. But if you are, like me, thinking that you can’t buy a home alone on an average salary, with a small deposit then honestly, just go in to your bank and have a chat with the mortgage adviser to realistically see if it is possible. I was surprised when I found out it was. Needless to say, with the small budget to buy has come the even smaller budget to decorate. And when I say budget, I mean non-existent pot of money which I’m scrimping about with. One of the considerations when browsing houses was the immediate decorating that needed to be done. Luckily the carpet in my house is really good quality and not that old. Apart from in the living room I’ve kept all the old owners flooring. The reason I wanted laminate flooring in my living room was simple due to the cats. With the both prone to shedding fur, I needed to ensure it was pretty low maintenance in there. If you own cats, particularly ones that are fluffy like Stevie, then you will know how much the fur literally clumps into the carpet! 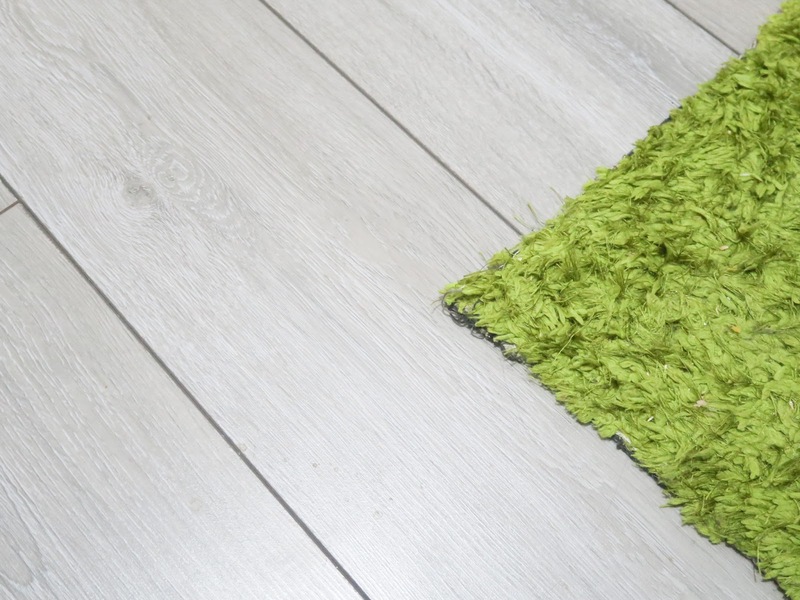 I chose grey laminate flooring just because it was a little different and with it being a small space I wanted light and neutral colours to open it up. I want to keep everything as light and airy as possible to try and encourage me to be a little bit tidier than I usually am. The grey laminate I got was from Wickes and cost me around £160 just for the packs of the laminate. It’s amazing how quickly the costs add up though. Not only did I need to get the underlay, which was an additional £40, but then I also needed the moulding to go around the edge (which ended up about another £30). With the floor done, I also needed to update the wallpaper. Luckily I found a discount wallpaper shop in Crewe. After an afternoon browsing all the different options, I went for a multi-toned grey and white branch design. Even though it isn’t my first choice when it came to the living room wallpaper, I wanted something that was more longterm, rather than trend-driven. The main expense was the floor and the wallpaper, but to finish the room off, I needed some other simple ways to make everything ‘fit’. My Ikea sofa was red corduroy in a previous life but then I discovered you can actually buy new covers for them pretty cheaply! Well, depending on the colour. The beige one I’ve ended up with was around £50, but the grey one I wanted was almost £100! This one will *do* in the meantime and definitely more fitting than the red one. All is not lost with my hopes of the grey seating though. I was sent this amazing grey feature chair from Lakeland Furniture recently and it’s so perfect for the living room, and I’m glad I didn’t go with my original plan of popping it in the spare room! It’s not just me that loves it though and the cats are very partial to having a lovely snooze on it, so putting it in the spare room (which they are banned from) would have been a complete waste anyway…. And finally, a few fleecy blankets are always the perfect addition to any room. In-keeping with the neutral theme, I picked up the beige one from Primark for around £4 and the grey one, which is the softest fleece ever, was from TJ Hughes. See more about that in this post here. Next I’ll be conquering the bedroom. Stay tuned to see how that works out. Previous Post Beauty Blog: Is Olaplex Any Good?